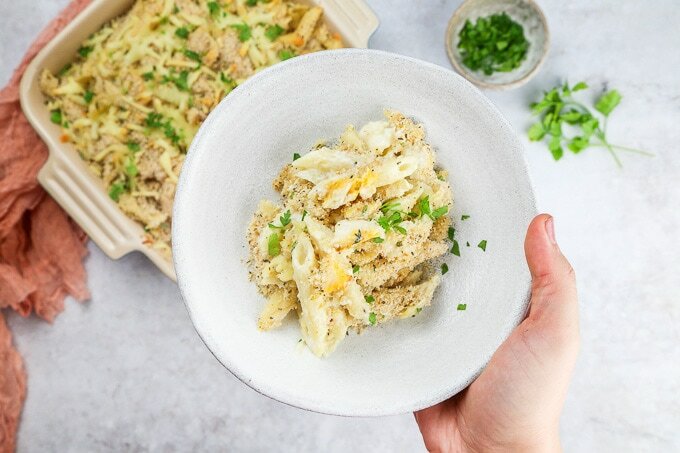 This smoked haddock pasta bake is the perfect family friendly meal. Super creamy penne pasta tossed with baked and flaked smoked haddock, infused with a delicious mustard and cheddar sauce. This pasta bake is topped with a seasoned breadcrumb topping, and melted cheddar cheese. It’s great to to prepare over the weekend, to cook at the beginning of the week. The weather is getting colder and I’ve been making lots of soups, casseroles, and pasta bakes. We love pasta bakes in our family, they’re comforting, filling and delicious. Pasta bakes can also be super convenient as they can be prepared one day ahead, to be cooked in the oven on the next day. This makes life so easy, especially at days when I have work to do and my family are coming over in the evening. 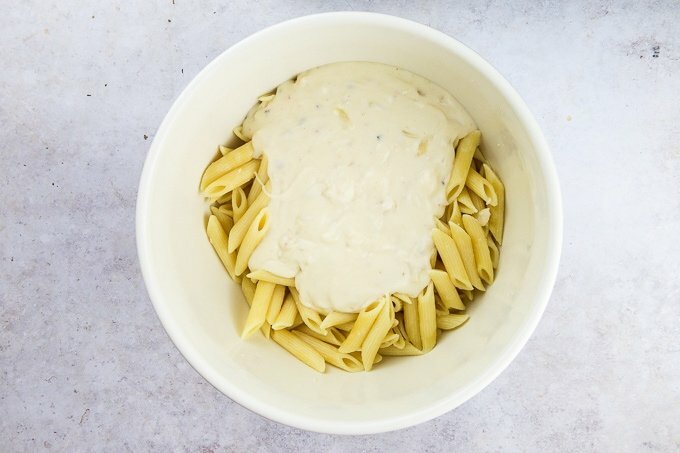 There are many types of pasta bakes, but my favourite way to enjoy pasta is with a super creamy white sauce. Imagine, pasta, creamy sauce and cheese. This is my favourite combination ever! The Saucy Fish Co. is one my favourite fish brands that I cook with all the time. They offer a great range of fish paired with delicious sauces and dressings. Fish and sauce is a match made in heaven! I mean, how can anyone eat fish without sauce? But when it comes to cooking at home, many people find it difficult to fillet and flavour fish at home. 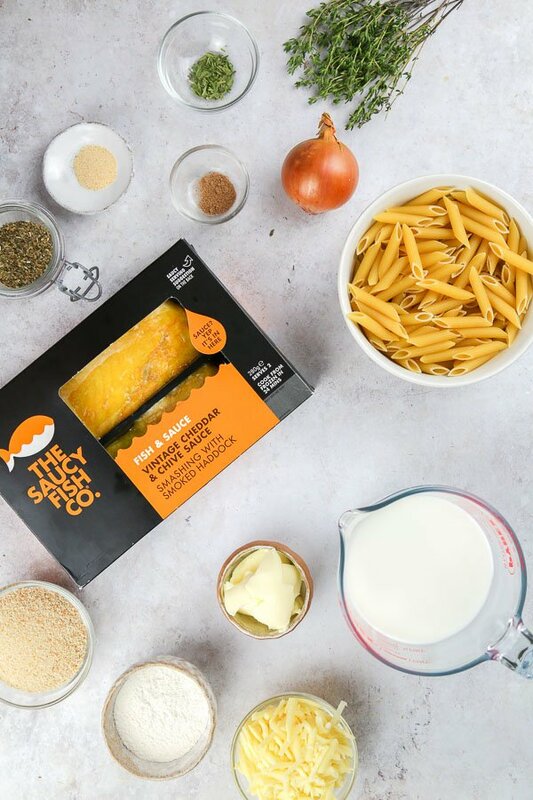 The Saucy Fish Co. are making life easier by offering a wonderful range of inspirational fish and sauce combinations, and saucy-centred fishcakes, that come either chilled or frozen. So next time you’re planning to cook dinner, and you’re not sure what to make. Grab a few packs of The Saucy Fish Co. fish, and make yourself a healthy and delicious meal at home. In this recipe I’m using Cook from Frozen Smoked Haddock with Cheddar and Chive Sauce that is paired with a delicious vintage cheddar and chive sauce. The Saucy Fish Co. have some exciting new listing news. The new listing is in The Food Warehouse, by Iceland which has over 80 stores nationwide – you can find the stores in the store locator here. If you follow me on Instagram, and watch my IG stories then you probably have seen that I went The Food Warehouse today to pick up a few Saucy Fish Co. products. There are 4 products listed in The Food Warehouses, and that includes frozen Smoked Haddock with Cheddar and Chive Sauce, Salmon with Chilli, Lime and Ginger Dressing and two saucy-centred fishcakes varieties – all of which are cooked directly from frozen. I usually prefer to buy frozen foods for a couple of reasons. 1) Frozen foods are fresher than fresh foods because they’re normally frozen right away, while the fresh foods take at least a few days until they get to the consumer. 2) I always stock up on frozen foods like fruit, veg and frozen fish, and cook with it whenever I need to. This is not only convenient, but it also cuts down the food waste and saves me money! Fish – I’m using Smoked Haddock from The Saucy Fish Co.
Penne pasta (or any other kind of pasta that’s similar in size to penne). + salt and olive oil to cook the pasta. Ground nutmeg, ground black pepper and salt. 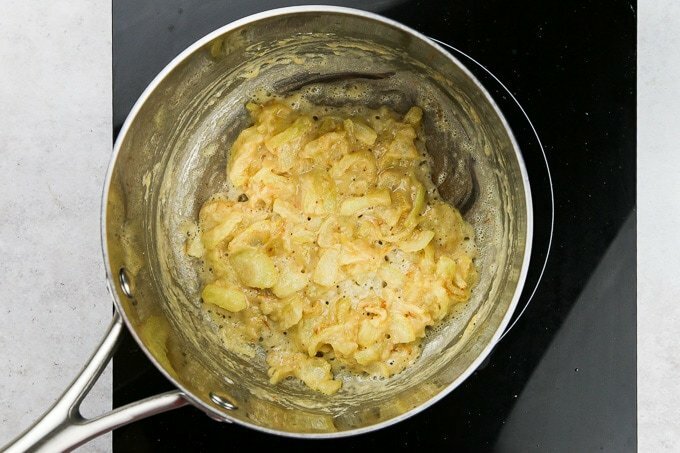 You could also add a clove of garlic when making the creamy pasta sauce. Cheese (I used shredded cheddar cheese). Step 1. Start by cooking the fish. 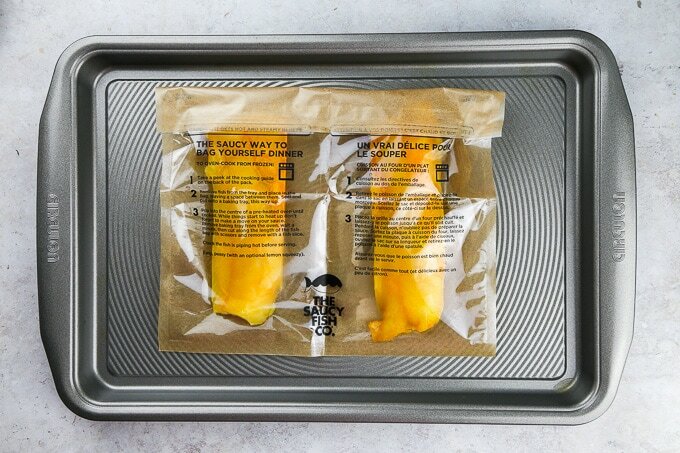 Simply place the frozen fish in the oven bake bag and onto a baking tray, make sure that the fillets are not touching. Bake on 180c for 24 minutes. 2. Once the fish is cooked, it will look like the picture below. It will be pipping hot when you take it out of the oven, handle with care. 3. Pour sauce over fish, this will infuse the fish with gorgeous flavours of mustard, cheddar and chive. 4. Using 2 forks, flake the fish. Set aside. 5. 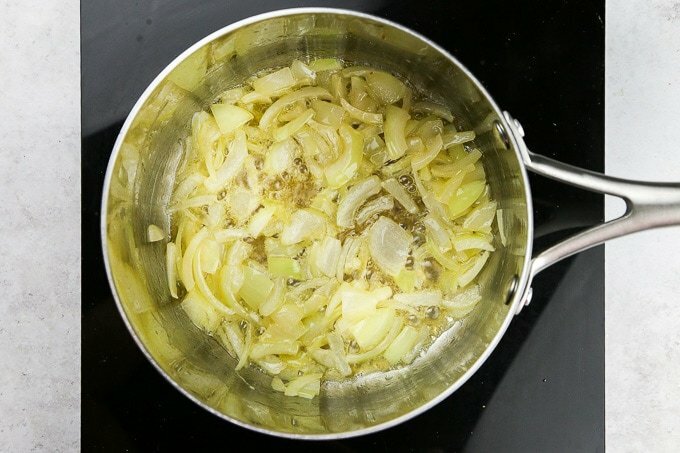 In a medium saucepan, melt the butter and add a diced onion. On low-medium heat, cook the onion until it comes soft and translucent. Make sure not to burn the butter. 6. Add the flour, this will cause the butter to kind of crumble but that’s okay as that’s exactly what you want. 7. Add whole milk, and using a whisk keep whisking the mixture until it starts to bubble. Add ground nutmeg, black pepper and salt. I also like to add a crushed clove of garlic. Remove from heat, and set aside. 8. Cook the pasta following the cooking instructions provided at the pack. 9. 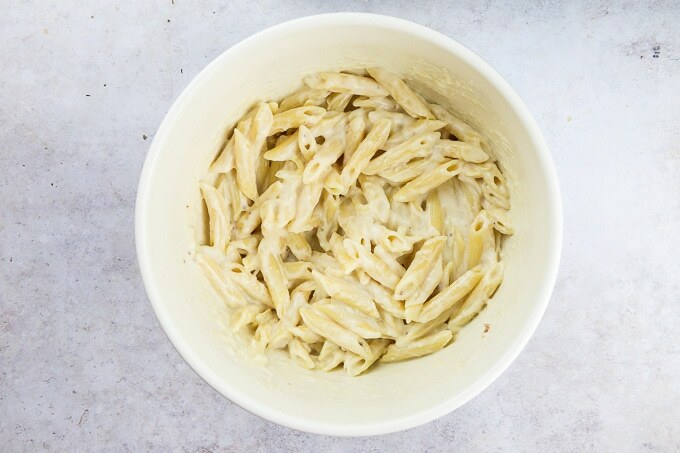 In a large bowl, mix the pasta with the white sauce. It is preferred that you do this while the pasta and the sauce are still hot. The sauce will start to thicken once it starts to cool down. 10. Add the flaked fish to the pasta. 11. Spread the pasta and the fish on a slightly greased oven proof dish. 12. Make the breadcrumb topping by mixing the breadcrumbs with the herbs and dried garlic. Sprinkle the breadcrumbs over the pasta. 13. Sprinkle with grated cheese, and bake for 20 minutes at 180c. 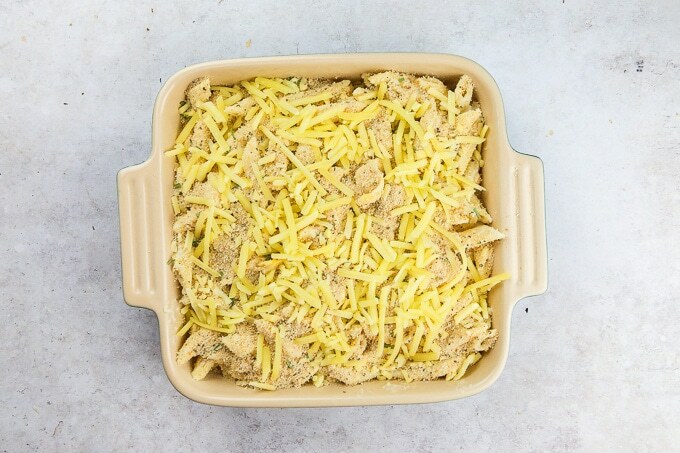 The fish pasta bake is ready when the cheese melts and the breadcrumbs become golden. Garnish with chopped parsley and serve! Always make sure that the oven proof baking dish is greased, as otherwise the pasta might stick to the bottom of the baking dish. Pour the cheddar chive sauce directly over the fish. This will give your pasta bake an amazing flavour! Do not overcook the white sauce. 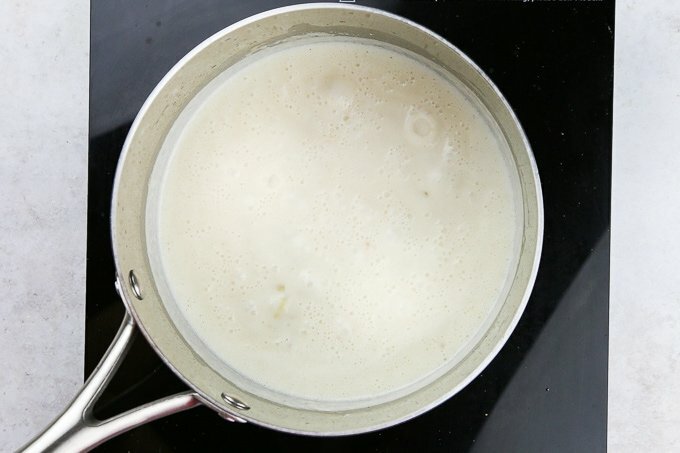 As the milk starts boiling and mixture starts to thicken, remove from heat immediately. Because the sauce will continue to thicken as it cools down. 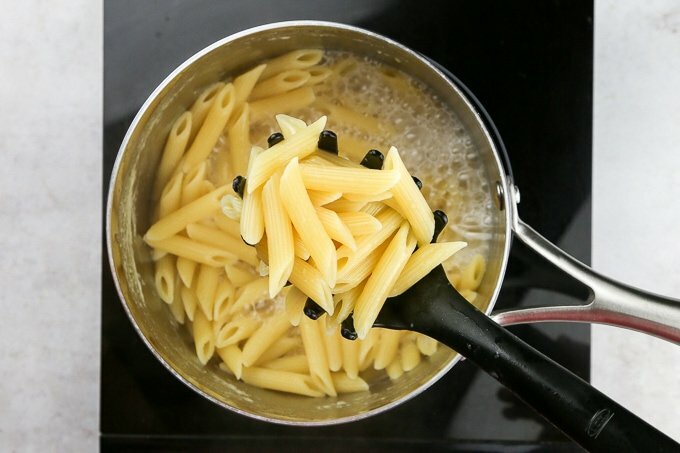 Cook pasta al dente, which means that you have to cook it for 1 minute less than what it says on the package instructions. The pasta will also be cooked again in the oven, and cooking it al dente will help you avoid overcooked pasta that breaks. Make sure to pop over to The Saucy Fish Co website to check out their whole range. And follow them on Instagram, Facebook and Twitter. 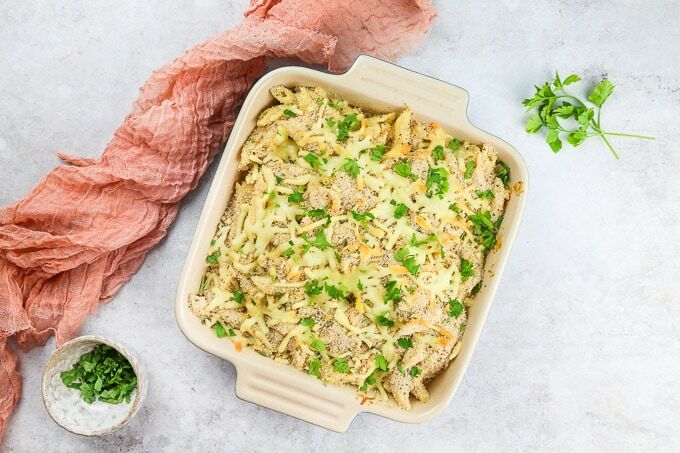 If you make this pasta bake using my recipe, please don’t forget to rate this recipe and share a picture on social media. Tag #LittleSunnyKitchen in your posts as I would really love to see what you make! Thank you for supporting Little Sunny Kitchen, so I can keep sharing my tasty recipes with you for free. 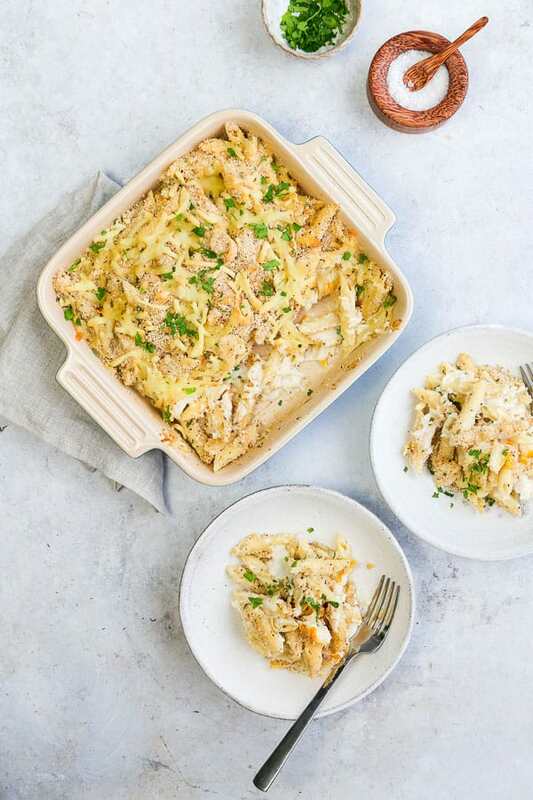 This smoked haddock pasta bake is the perfect family friendly meal. 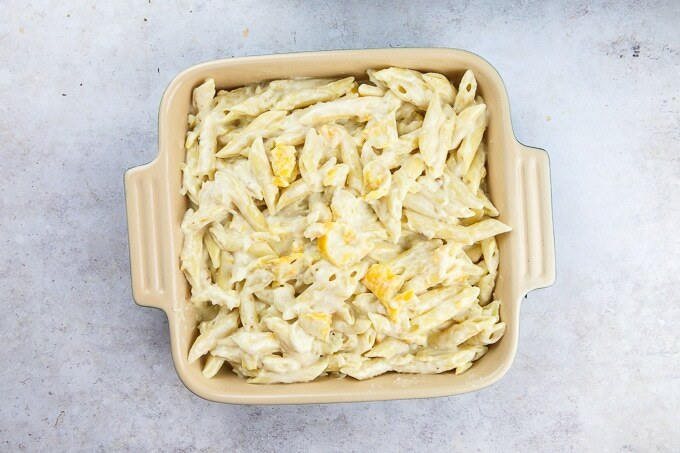 Super creamy penne pasta tossed with flaked and baked smoked haddock infused with a delicious mustard and cheddar sauce. Topped with a seasoned breadcrumb topping, and melted cheddar cheese. This pasta bake is great to prepare over the weekend or to cook at the beginning of the week. 1 pack Smocked Haddock with sauce The Saucy Fish Co.
250 grams Penne pasta or any other kind of pasta that's similar in size to penne. + salt and olive oil to cook the pasta. Cheese I used shredded cheddar cheese. Start by cooking the fish. Simply place the frozen fish in the baking bag, make sure that the fillets are not touching. And bake on 180c for 24 minutes. Once the fish is cooked it will look like in the picture below. It will be pipping hot when you take it out of the oven, so handle with care. Pour sauce over fish, this will infuse the fish with gorgeous flavours of mustard, cheddar and chive. Using 2 forks, flake the fish. Set aside. In a medium saucepan, melt the butter and add a diced onion. On low-medium heat, cook the onion until it comes soft and translucent. Add the flour, this will cause the butter to kind of crumble but that's okay. Add whole milk, and using a whisk keep whisking the mixture until it starts to bubble. Add ground nutmeg, black pepper and salt. I also like to add a crushed clove of garlic. Remove from heat, and set aside. Cook the pasta following the cooking instructions provided at the pack. 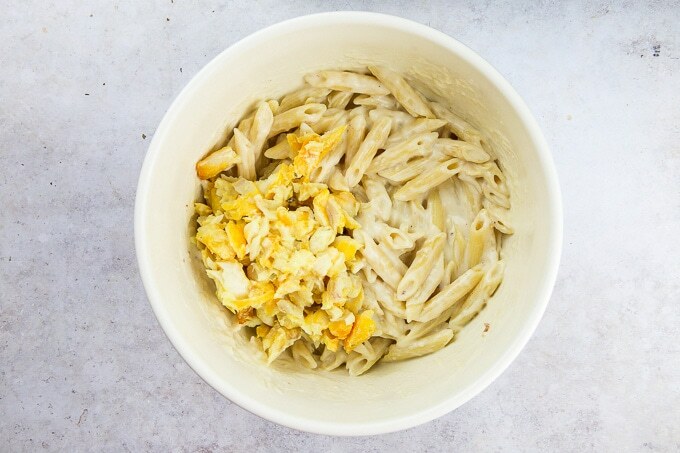 In a large bowl, mix the pasta with the white sauce. Add the flaked fish to the pasta. Spread the pasta and the fish on a slightly greased oven proof dish. 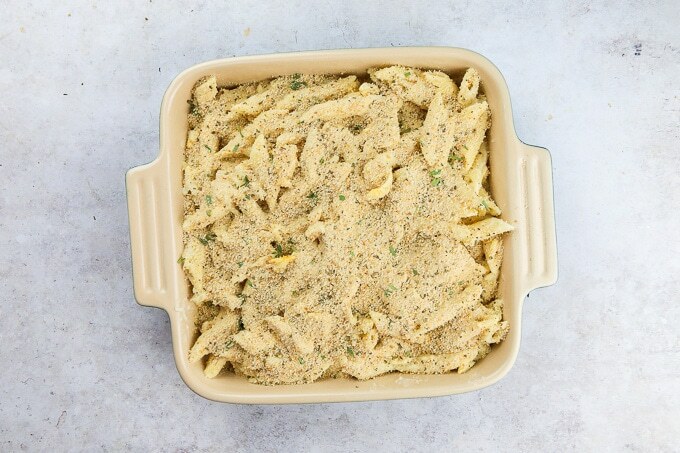 Make the breadcrumb topping by mixing the bread crumbs with the herbs and dried garlic. Sprinkle the breadcrumbs over the pasta. Sprinkle with grated cheese, and bake for 20 minutes at 180c. 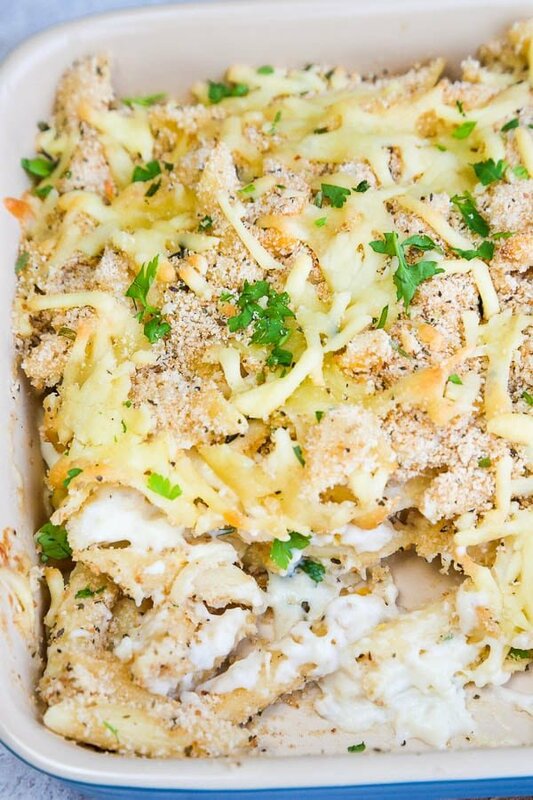 The fish pasta bake is ready when the cheese melts and the breadcrumbs become golden. Sprinkle with chopped parsley and serve! This post is sponsored by The Saucy Fish Co. Thank you for supporting the brands that make Little Sunny Kitchen happen. All opinions are my own. I love a good pasta dish, it’s always a big winner at family meals. Can’t beat it. Ohhhh I LOVE this!! The process shots you have along the way are PERFECT!! I can’t wait to give this a go.